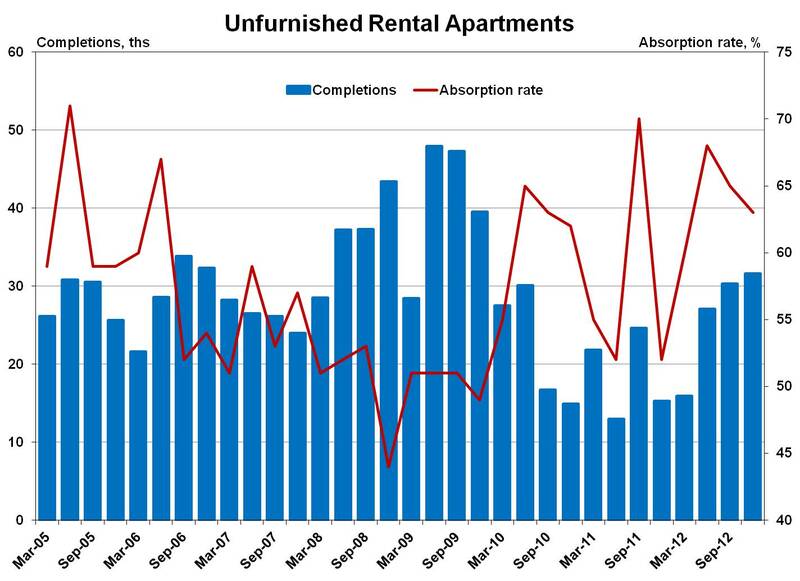 The most recent data from the Survey of Market Absorption of Apartments (SOMA) showed that completions of privately financed, nonsubsidized, unfurnished rental apartments continued to climb in the fourth quarter of 2012. The reported 31,600 completions in buildings with 5+ units were slightly above the third quarter level and more than doubled since the fourth quarter of 2011. At the same time, the absorption rates (units rented or sold after construction of the property is complete) remained high, close to 65 percent. Averaged over 2012, the apartment absorption rates reached 64 percent, a level not seen since 2001. 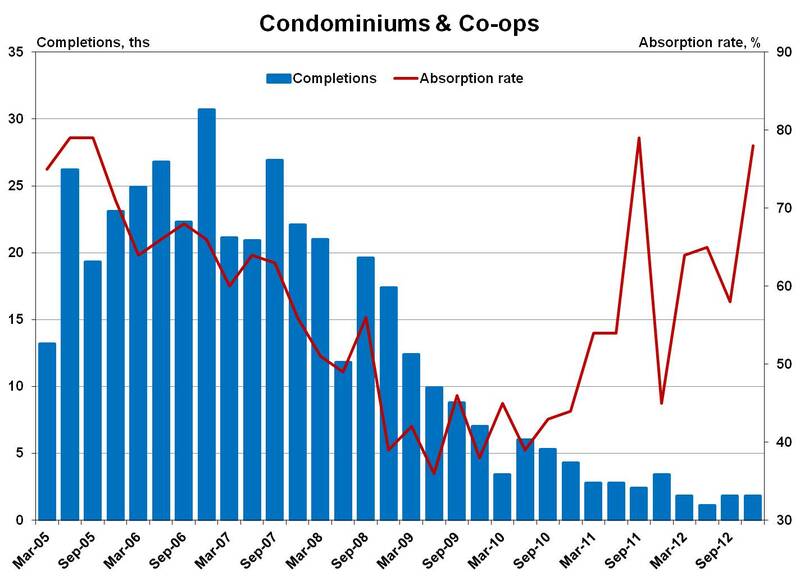 The condo and co-ops completions remained at historically low levels – only 1,800 units were completed in the fourth quarter of 2012. However, the condo absorption rates improved remarkably. About 78 percent of the condominiums completed in the fourth quarter of 2012 were sold within three months of completions. This rate is 20 percent higher from the previous quarter and 33 percent higher from a year ago. 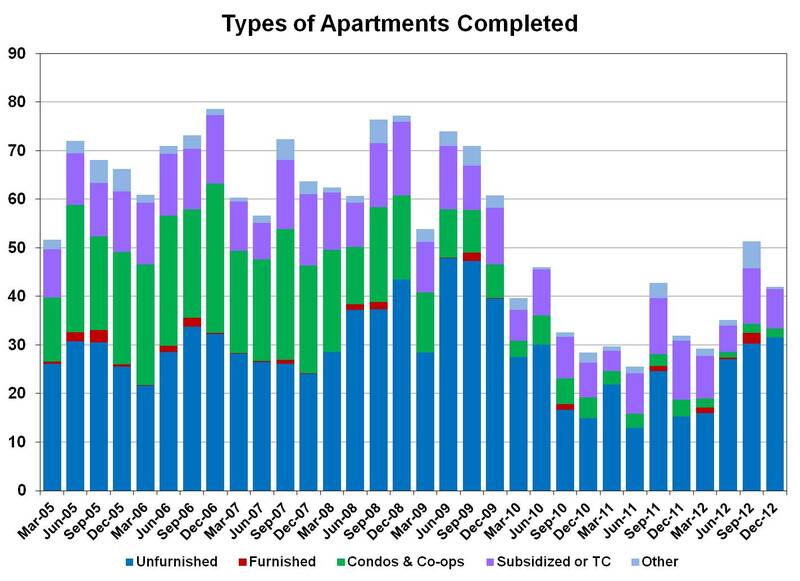 Over 2012 the condo absorption rates have averaged around 66 percent, marking the highest reading since 2006. 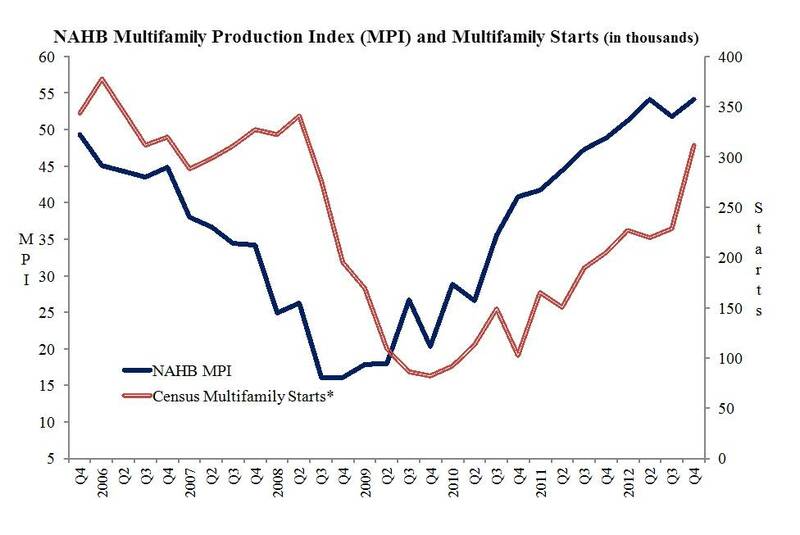 Leaner inventories should bolster condo and co-op construction activity going forward, but we expect these units will maintain a diminished share of overall 5+ multifamily production. The SOMA also reported that approximately 8,100 federally subsidized or tax credit units were completed in the fourth quarter of 2012. This represents a decline of 3,400 units since the previous quarter and 4,100 since a year ago. After three consecutive months of slight declines, private residential construction spending increased 2.2% on a month-to-month basis in February. Despite the sluggish readings from the prior 3 months, nominal spending on residential construction activity remained more than 20% above its year-ago level and roughly 36% higher than the cyclical low in mid-2011. The new single-family home category continued to show strength in February, gaining 4.3% versus January. Compared to February 2012, spending on new single-family homes has risen 34%, but perhaps more importantly, the level of nominal construction spending has surged more than 73% since bottoming out in mid-2009. Spending activity will likely expand further over the next two years as the current NAHB forecast calls for single-family housing starts to increase 23% and 29%, respectively, this year and next. The multifamily sector took a step back in February, with spending on new multifamily projects slipping 2.2% from January. In fact, this marks the first outright month-to-month decline for this category since September 2011. 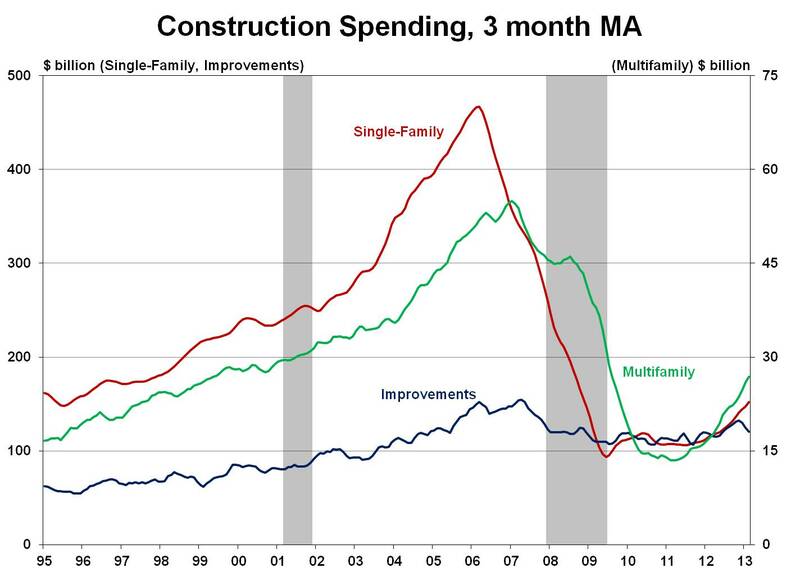 Still, the overall trend remains decidedly positive for new multifamily construction activity as the level of spending is 52% ahead of the pace in February 2012 and has more than doubled the August 2010 low point. 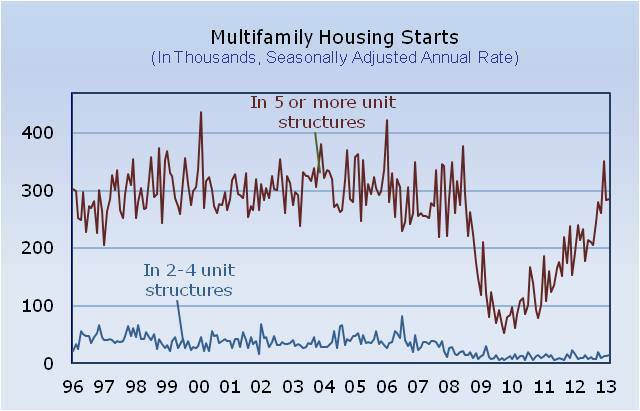 After a likely modest retrenchment in the first quarter of 2013, the baseline forecast calls for consistent gains in multifamily starts through the end of 2014. Home improvement spending improved slightly in February, gaining 0.5% versus the previous month and is 1.1% above the level from last year. Although this construction spending category is the most volatile and likely to be revised, the 3-month moving average suggests spending on remodeling activity has cooled over the past several months. Nonetheless, with existing home sales expected to register steady growth going forward, home improvement activity should see a similar pattern as sellers spruce up their homes for sale and/or buyers decide to make changes after they move into the home. 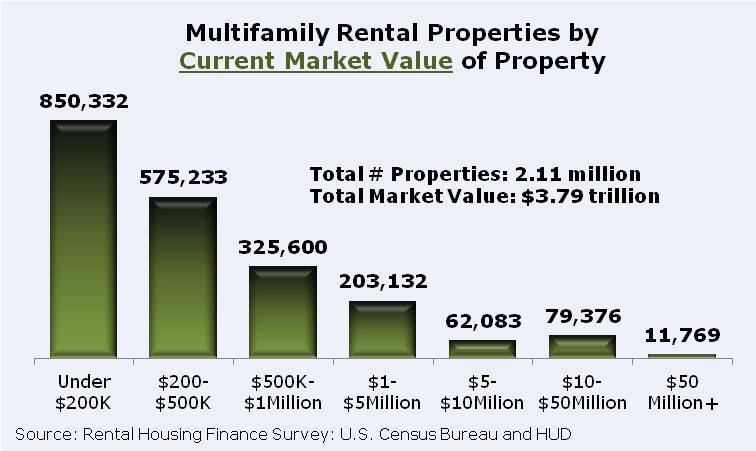 Multifamily Rental Properties: Would You Believe 2.25 Million? According to a new survey sponsored by HUD and conducted by Census Bureau, there are 2.25 million multifamily rental properties in the U.S. You may wonder if we really needed a new survey to tell us this. The short answer is yes. In the decennial Census and virtually all surveys of housing, the government goes to housing units and starts by asking questions of the occupants. You can count most single-family properties this way, but not multifamily properties that, by definition, have more than one unit per property. To fill the information gap, NAHB has been a strong advocate of something like the new Rental Housing Finance Survey (RHFS). One advantage of the RHFS is that it goes to property owners and mangagers, and therefore can collect information about items like upkeep and financing that tenants of rental apartments typically don’t know. But one of the reasons NAHB has long been advocating a property-level survey like this is simply to get very basic information on counts of buildings and properties. According to the RHFS, the lion’s share of the 2.25 million multifamily rental properties in the U.S.—1.64 million—consist of a single apartment building. There are, of course, properties with more than one building—nearly 100,000 properties have 20 or more. On average, multifamily rental properties turn out to have 2.5 buildings, so the total number of multifamily rental buildings in the U.S. works out to 5.6 million. A lot of the 2.25 million properties would be classified as small by most standards. Over 1.4 million of them are valued by their owners at less than $500,000. About 850,000 are even valued at less than $200,000. Although a little over 6 percent of owners failed to report the current market value of their properties to the RHFS, that still leaves more than 2.1 million multifamily properties, and they have a total market value that adds up to roughly $3.8 trillion. For readers who like more infomation, the Census Bureau has a number of additional statistics in tables posted on its RHFS website. NAHB is also in the process of analyzing the new multifmaily rental data and will feature it in upcoming blogs. For February of 2013, the Census Bureau’s preliminary estimate for starts in buildings with five or more apartments came in at 285,000 (at a seasonally adjusted annual rate). In the Census construction report, this shows up as less than a 1 percent increase from January, but the January number itself was revised upward by nearly 9 percent—so 285,000 is actually 9.6 percent higher than the preliminary starts rate for January originally reported in last month’s blog. Although well below the anomalous spike of December, the February 2013 five-plus starts rate appears strong compared to any other month from recent history (the same general pattern seen in total housing starts). Another interesting statistic in the February 2013 construction report was the (seasonally adjusted annual) rate at which new five-plus permits were issued during the month. The new five-plus permit rate increased 7.5 percent to 316,000—which at first may not seem terribly dramatic, but is up nearly 55 percent year-over-year and the highest the five-plus permit rate has been since July of 2008. The number of unused previously issued five-plus permits remaining in the pipeline at the end of the month also remained relatively healthy at 47,700 (not seasonally adjusted)—up 2.7 percent from January and 46.4 percent year-over-year. Overall, the permit numbers have been strong enough to support a five-plus starts rate as high as February’s 285,000 over the next couple of months. 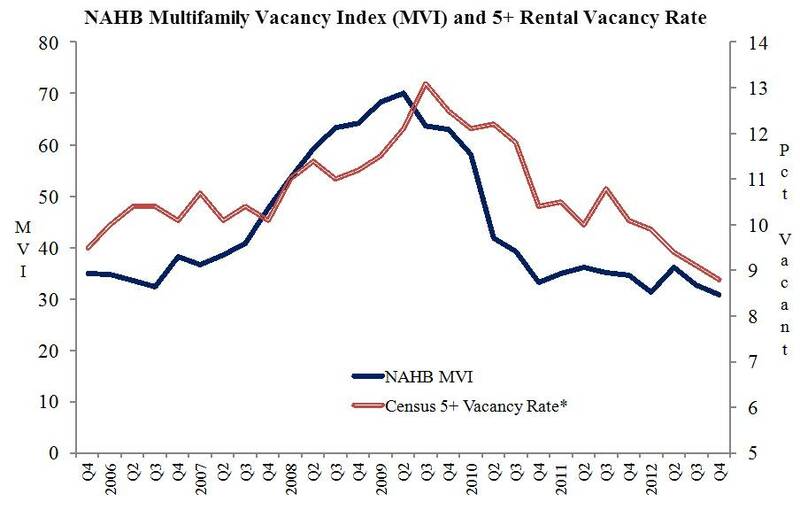 In the fourth quarter of 2012, NAHB’s Multifamily Vacancy Index (MVI), which measures property owners’ confidence in the strength of the market for existing rental apartments, improved slightly—falling two points to 31. Because the MVI captures the industry’s sentiment about apartment vacancies, lower numbers are better. After peaking at 70 in the second quarter of 2009, the MVI declined consistently through 2010 and has remained at a fairly low level in the low to mid 30s throughout 2011 and 2012. So, in this respect, the fourth quarter gave us more of the same. Historically, the MVI has tended to foreshadow the Census Bureau’s measure of rental vacancies in buildings with 5 or more apartments. When conditions are changing, the MVI generally turns at least one quarter before the 5+ vacancy rate. Recently, both measures have been edging downward. At 31, the MVI is currently as low as it’s been since NAHB initiated the survey in 2003, while the 5+ vacancy rate has dipped below 9 for the first time since 2000.